Sometimes you need a little help setting up your podcast app. This is a step-by-step guide to help you setup the podcast in each of these podcast apps. Get answers to common podcast feed issues at the bottom of this page. View the Members-only podcast URL and setup guide. 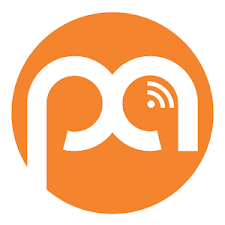 Get podcast apps for Android smartphones and tablets. Get iOS podcast apps for Apple devices like iPhone and iPad. Troubleshoot common issues in most podcast apps. Why should I use an app to listen? The convenience of having a mobile podcast app makes listening a breeze. Setup is easy and you can be up and running in just a few minutes. Keep downloaded shows for on-the-go listening and browse individual episode details and guest segments with embedded chapters. Completely customize your listening experience by adjusting playback speed and never lose your place with the handy chapter markers. You can even access the podcast across all your devices from one single account. There are just two criteria that these Steel on Steel compatible podcast apps need: our podcast URL and your Steel on Steel membership login info. When adding our podcast to your app, the app will require you to enter the URL first, in the +or ‘add URL’ screen. Afterward, you’ll enter your username and password. Tap and hold or ‘long press’ on the URL to open the ‘link options’ menu on your device. Select ‘Copy‘, then open your podcast app and paste the URL into the ‘Add Podcast Manually‘ or ‘Add URL‘ field. Do not tap to open the URL in either the ‘News‘ app or the ‘Podcasts‘ app. Apple’s native apps don’t support password-protected feeds like ours. Here are a few compatible apps for both Apple iOS and Android based smartphones and tablets. These have been tested with our password-protected members-only feed. Choose from the options below and tap on the icons to download the apps from their respective app stores. There are setup instructions for each, and a troubleshooting guide at the bottom of the page if you need help. 1. Press the main screen + button to add a new podcast. Then select the ‘RSS feed’ option. 2. Tap the top menu option to enter the RSS feed URL. ‘Tap and hold‘ the link below to copy. https://www.steelonsteel.com/podcast.php Then paste into the field on step 3. 3. Enter the feed URL. You will have to check the ‘Authentication’ checkbox and enter your login/password. After validation, the app will update the podcast. You can change the login/password at any time by long pressing on the podcast, then selecting ‘Custom Settings’ and finally ‘Edit podcast URL’. 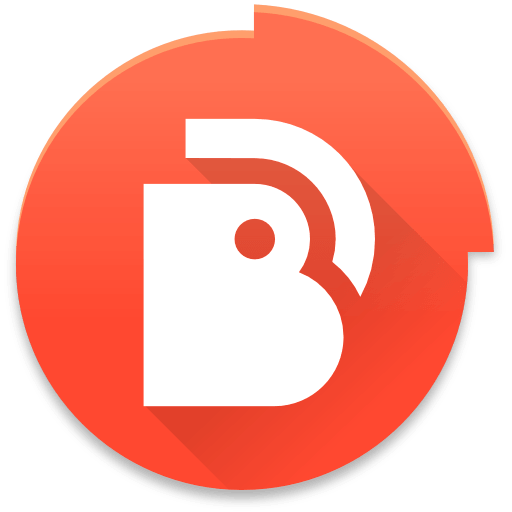 Get BeyondPod for Android in the Google Play Store FREE! 1. Tap the Menu button on the top left of the main screen and a menu will popup. 2. Scroll down until you see +Add Feed. Tap to begin. 3. In the top right corner is Import Feeds, tap and select enter Feed Address. 5. At the bottom of the same page, tap Advanced Settings. 6. Scroll down to Feed Authentication, and enter your username and password. Tap Save in the top right corner. 7. The Steel on Steel podcast feed will appear in the What to Play menu. 8. Tap Download to begin an episode. To change the setting for the podcast, tap the menu in the right top corner of the podcast and select Edit Feed. 1. Tap the + icon to add a new podcast. 2. In the Add Podcasts screen, tap Add Podcast Manually. 4. Enter your username and password, tap Done and then at the top of the screen, tap Subscribe. 5. Tap the Downloads icon at the bottom of the screen and enable the download que. Playing the weekly podcast is as simple as tapping the icon in the main screen and selecting the episode to play. To view or change your stored login info for the podcast, tap the Steel on Steel podcast icon in the main screen. On the next screen, tap the Gear icon on the bottom right. Go all the way to the bottom of the Settings page. Under Login Credentials, you can edit your login info. If the podcast won’t play or if you think the settings are incorrect, you can always just delete the podcast from the main screen and set it back up using the instructions above. 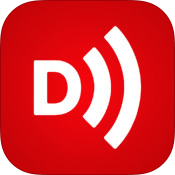 Download RSSRadio FREE in the Apple App Store! 1. Tap the + icon in the top right corner. 2. In the Podcast Directory, tap the More… button on the top right corner. 3. Tap “Enter the URL Manually“. 6. 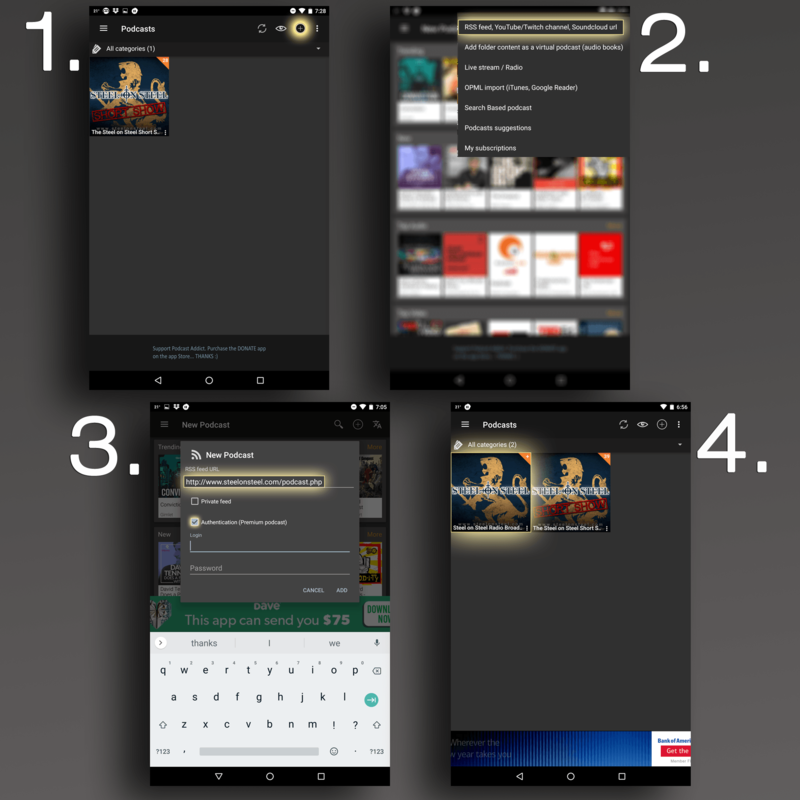 Next, tap the Steel on Steel Radio Broadcast icon, then choose an episode to listen to and tap to begin. 7. In the podcast episode screen, tap Download. 8. Enter your Steel on Steel membership login info (info is case sensitive). 9.Go back to the main podcast screen by tapping the <Podcast button in the top left hand corner. 10.Tap the Downloads button at the bottom of the main Podcast screen. The podcast episode will automatically download to your device and can be played once it’s finished downloading. Enjoy! 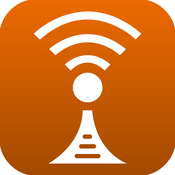 Get the Overcast App FREE in the Apple App Store! 1. Tap the + icon in the upper right corner of the main Overcast app screen. 2. Tap “Add URL” in the upper right corner. 4. 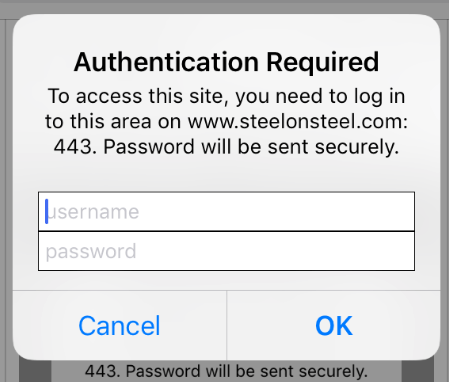 Tap “Use Password” then enter your Steel on Steel login credentials. (Login info is case sensitive) Tap “Done”. 5. In the main Overcast screen under “Podcasts”, tap the Steel on Steel Radio Broadcast icon. The next screen will show “Unplayed, All and Settings”. Tap “All” to choose from the list of episodes. Occasionally, you may encounter common issues with a podcast reader or feed. Here are a few tips to remember. I don’t see the Steel on Steel feed in the podcast directory when I search. If you get the “Episode Unavailable” message on your iPhone or iPad, be sure you’re not using Apple’s Podcasts app. This can also occur when you tap on the podcast URL and open the link in Apple News. News will attempt to add the podcast feed to Apple Podcasts which isn’t compatible. Apple has dropped support for password-protected podcasts like ours, so you must use a compatible app like the ones suggested above. Apple may eventually support secure feeds like ours in the future, but for now, check out the feature-packed alternatives like Downcast, Overcast, RSS Radio and others. 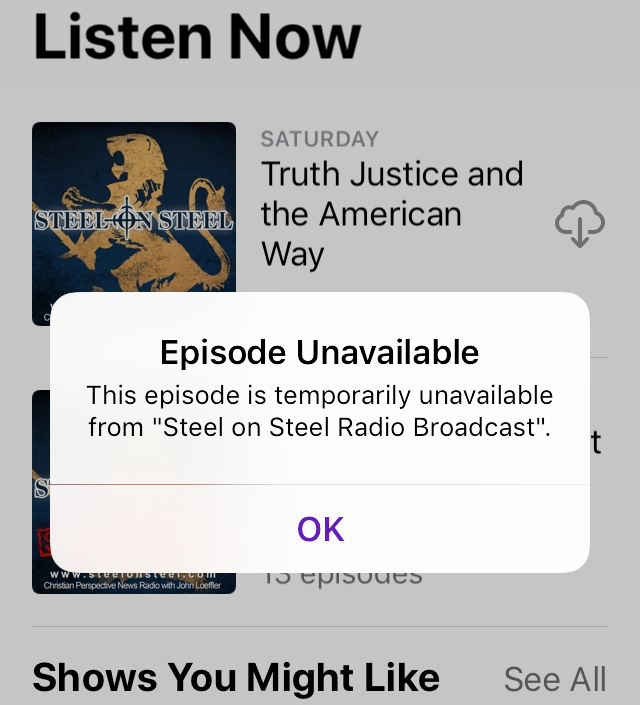 My podcast app won’t download Steel on Steel episodes or I get an error. Remember, our podcast feed is password-protected so downloading requires your app to be able to handle authentication. If you cannot find settings for username and password in your podcast app, we have alternatives above that handle the secure feeds. If you have the correct login info stored but still can’t download, check that you’ve entered the correct username and password. If that still doesn’t fix it, you may need to refresh or reset the podcast feed in the individual app settings. Unfortunately, we cannot guarantee the functionality of third-party apps and updates. If all else fails, you can simply delete the podcast and set it back up or try another app. My app isn’t updating the most recent episodes. Can other members of my family listen to the podcast from my account? Yes! You and other members of your family can share a single podcast subscription and share it across all your devices. Keep in mind that this convenience is intended to allow a family to enjoy the program, and sharing your login information will allow others to gain control over your account. If you want to share the program with coworkers, extended family and friends, why not give a free trial gift subscription or a longer duration paid gift sub. Can I stream the episodes or do I need to download them? The streaming option availability depends on the app, its version, and its settings. For instance, RSSRadio for iOS 10 will allow streaming if the streaming function is enabled in the Settings page of the podcast. However, Some apps don’t support streaming at all, or allow hybrid streaming once the episode begins to download. Please check the developer’s specifications for your particular app in the app store or developer’s website. Can I move my podcast subscriptions between apps? Absolutely! You can migrate the podcast subscriptions and episodes easily with this handy guide from ‘Tech Guy Eric’. Yes! Starting February 18, 2017, all future episodes will have chapter breaks so you can listen to individual segments of the program on your mobile device. 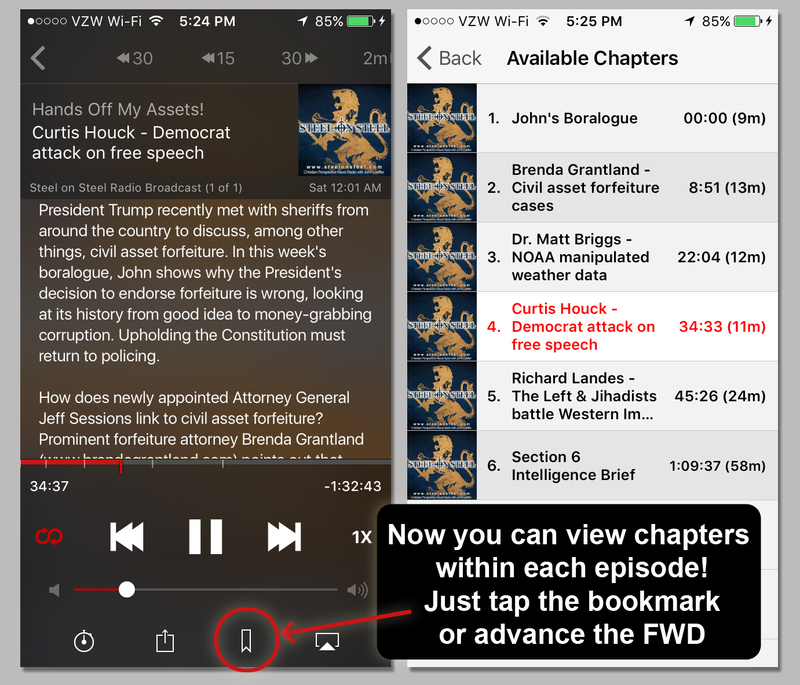 The chapters function is best experienced in Downcast for iOS, but should work in most podcast apps that support chapters, including Podcast Addict, RSSRadio and others. To view the chapters, first download an episode within the app and then tap the bookmarks or chapters icon. Click the image to view larger. Won’t all those episodes fill up my device or use a bunch of data? You can always adjust the download order and keep/discard settings for your podcast episodes. Typically, the default setting is to automatically download the most recent episode and delete the listened-to episodes after 24 hours. Each episode is between 33 and 65MB each. I’ve tried everything, but the podcast isn’t updating or downloading. Sometimes, an app can get stuck and rebooting the app or device doesn’t fix the issue. Typically, just resetting the podcast in the app will resolve this problem. Just open the affected app, go to the Steel on Steel podcast and select Unsubscribe. Don’t worry, it’s not going to affect your membership, but you will delete any episodes you’ve downloaded unless you transfer them to another computer. In some instances, the app needs to be completely deleted and reinstalled. You can use the instructions above to setup the podcast once more. It takes just a few moments and you’ll be back up and listening to your favorite episodes. I get a persistent “Authentication Required” popup screen on my iPhone or iPad that’s telling me to login. Please note: cancelling your subscription will not solve the issue. Start by turning off the wifi connection before removing the Steel on Steel podcast from the affected device. You should also remove the podcast from any computers you use to sync from. Always restart your device to confirm the setting changes. The podcast can easily be set back up and synced to your mobile devices or use a podcast app like Downcast to access the show on your iOS devices. Steel on Steel is a password-protected podcast, and almost all podcast apps try to download and refresh podcasts added in them. So when they try to fetch this protected podcast, this authentication popup shows, and if they enter a valid login with active subscription the popup will go away, and with an incorrect login it keeps showing the popup. If they are not active members they need to delete SOS podcast from iTunes or their podcast apps, and if SOS podcast url is opened in Safari tab they need to close it, then the popup will go away.